Cliff Diving in front of a magical volcano backdrop in the Azores with Orlando Duque, an iconic figure in the Cliff Diving World, as personal coach. Water is the element of life, which no one can convey as inspiringly as the 44-year-old Colombian Orlando Duque. The cliff diving legend takes us on a glamorous 14-metre catamaran to a protected volcanic island, where we dive, snorkel and swim with dolphins. A whale might even drop by on good days! Of course, he shares all the secrets of cliff diving with us as well. 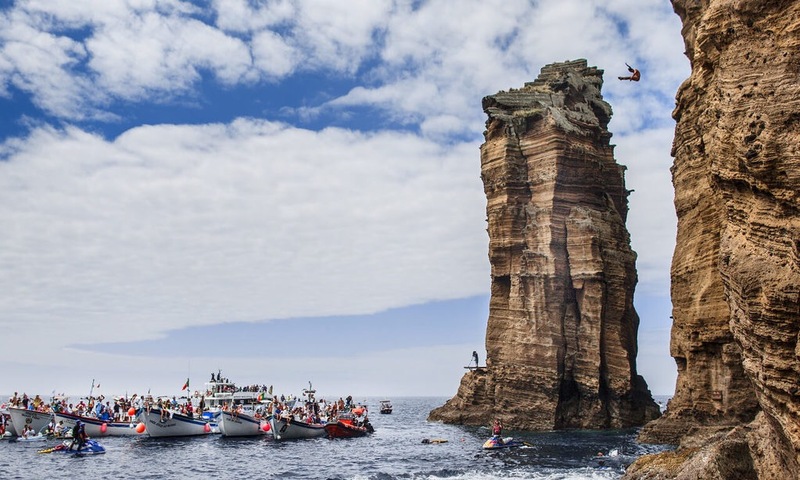 To see how the pros do it, we experience the Red Bull Cliff Diving event as VIPs backstage – closer than anyone else! Experiencing the element water with Orlando Duque, including snorkelling, scuba-diving and a personalized cliff diving workshop with individual heights to jump from. Watching the Red Bull Cliff Diving event from a glamorous 14-metre catamaran. Meet & greet with all the stars of the cliff diving scene. 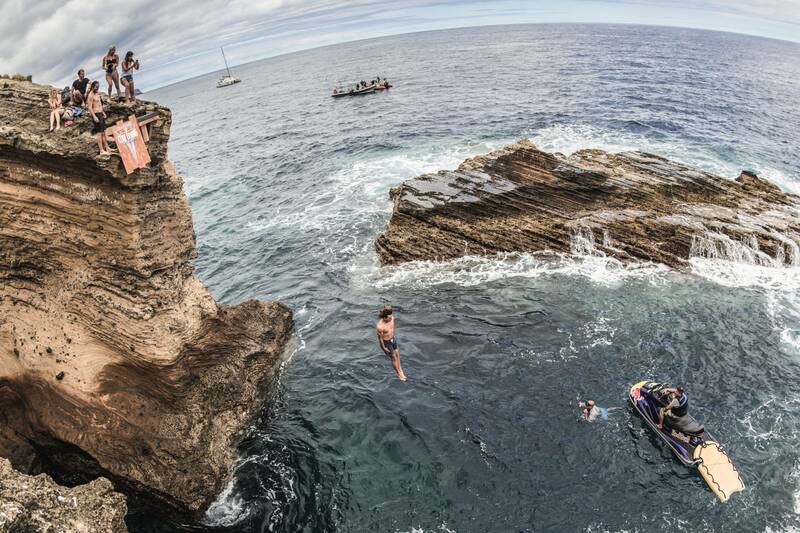 Tour of the 27-metre high cliff diving platform with Orlando Duque. Four nights at the stylish Santa Barbara Beach Resort with a view of the Atlantic Ocean. Three exquisite dinners at first-class restaurants on the Azores’ main island São Miguel. The secret bays, the tea plantations, the best spots for whale watching. There’s so much to explore. I want to convey this unique feeling of free fall – every second of cliff diving should be a pleasure. Having arrived at the Ponta Delgada Airport on the main island of the Azores, São Miguel, we meet at the hotel, the paradisiacal Santa Barbara Resort. We freshen up, talk through the details of the coming days and go out for our welcome dinner. Together with Orlando Duque, we dive into the wonderful world of water on the Azores. Thanks to the wetsuit, the Atlantic Ocean doesn’t feel cold at all, while we go snorkelling, scuba diving, dolphin and possibly even whale watching, plus try out cliff diving for the first time with the superstar of the cliff diving scene. No worries: Nobody has to jump from a height of 27 metres into the sea like the pros. Orlando takes every guest individually and based on the person’s own strength to his or her personal limit. In the evening, we enjoy regional delicacies at the Saca Rolha Tavern with Orlando. São Miguel is filled with highlights. Surfing on the northern beach, hiking or mountain biking in the inland areas, excursions to the volcanic landscapes with their spectacular crater lakes, relaxed bathing in hot springs – today, all guests can do what they enjoy the most. We’re here to have fun, after all. A 14-metre catamaran takes us to the island where the Red Bull Cliff Diving World Series event on the Azores takes place and drops anchor barely 50 metres from the competition. Stand up paddle boards are available for those who want to get even closer. Let the action begin! After the contest, we climb up to the rock with the cliff diving platform at a height of 27 metres. This way, we get a dramatic impression of the actual challenges of cliff diving. Dinner with the athletes is the perfect opportunity to ask the world’s best cliff divers all questions we have always been yearning to ask. Breakfast, a last glance to the Atlantic Ocean, then we return to the Ponta Delgada Airport and start the journey home.